The Monkey’s Mask is a totally unique experience. It’s poetry. It’s a crime thriller. It’s where high art meets low life, passion meets betrayal, and poetry faces profanity on the streets of a harsh modern city. Dorothy Porter’s internationally bestselling verse novel holds you in its grip from the first verse paragraph to the final haunting pages. 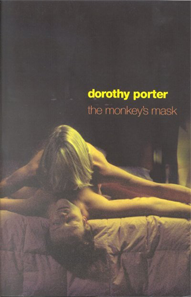 Dorothy Porter is an acclaimed poet, lyricist and librettist. Before Time Could Change Us, for which she wrote the lyrics (and Katie Noonan sang on the album), won an ARIA for Best Jazz Album 2005. Her second opera, The Eternity Man, for which she wrote the libretto, is in pre-production with the UK’s Channel Four for a film. She is the author of the bestselling The Monkey’s Mask, What a Piece of Work, and Wild Surmise, all of which have won numerous literary awards. Dorothy passed away in December 2008 at the age of 54.